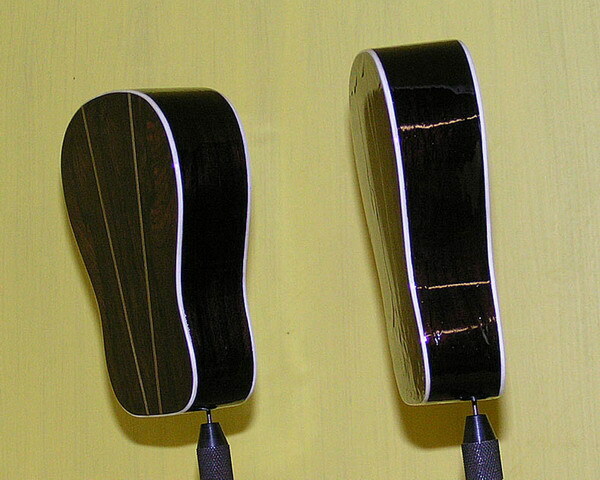 The finishing and lacquer of the Mini’s is, like for a normal guitar, time consuming, especially when you don’t have a spray cabin. I had to use a nice soft brush to apply the cellulose lacquer. This type of lacquer dries quickly and has no discolouration. However, each time you apply a new layer it will dissolve the previous layer, making it a difficult task. After applying 5 layers I had the babies left drying for a week. 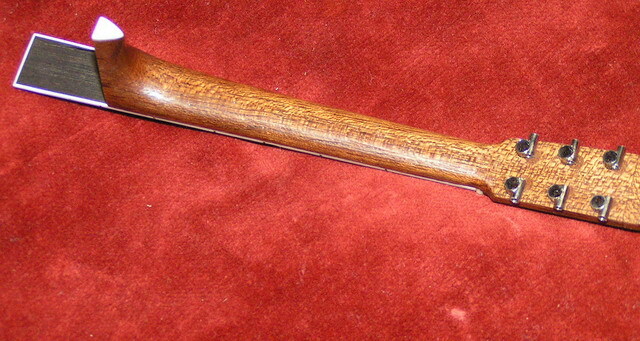 I then started sanding and polishing to obtain a uniform finish. It happened a few times that I went through the lacquer layer and I had to start all over again. Also, just polishing a bit too long resulted in white areas due to overheating. 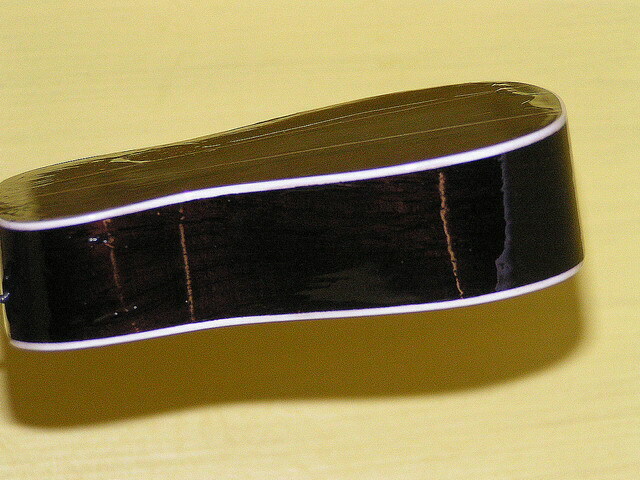 So making a guitar with a nice smooth and glossy finish isn’t that easy at all! 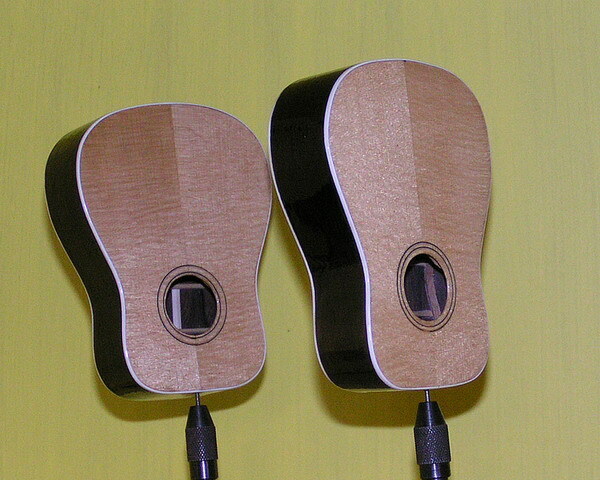 After putting the neck and bridge on the body I adjusted the holes where the bridge pins should fit in. The saws I had to use for this job where getting smaller and smaller, sometimes it was nearly possible, but as they say: “it’s dogged does it”! 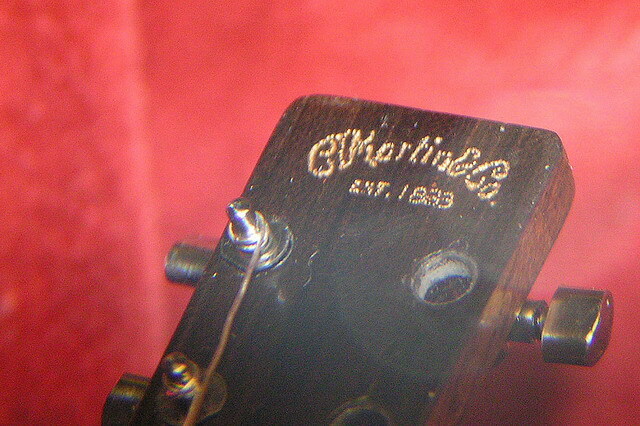 Then next to the Martin logo. There are no brushes available of this size which could do the job )at least not to me). But if you have started a project like this then you cannot stop anymore at this point. 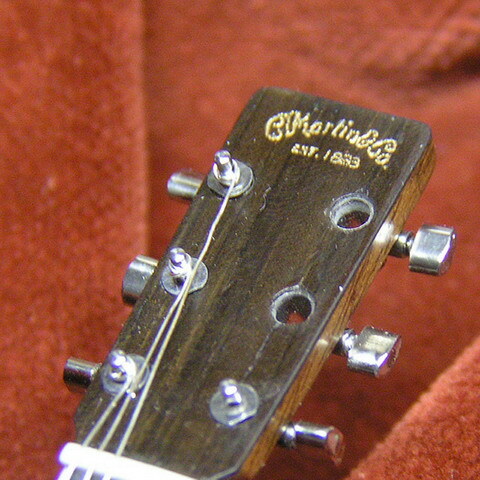 Eventually it appeared to be very simple: I first glued a copy of the Martin logo (from a brochure) on the head and then pricked with a needle little holes through the paper into the wood. After removing the paper I filled the holes with gold paint and whipped off the surplus of paint with a cloth. The end result is pretty good, considering the size. Doing the strings wasn’t expected to be a difficult task, but that turned out different. 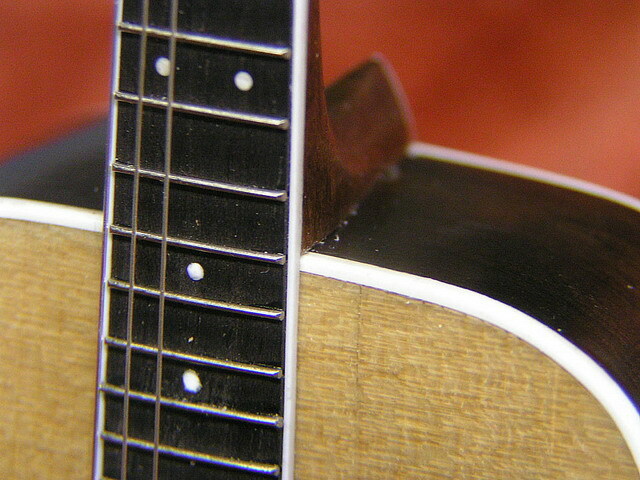 The lower E string had to be 0.3 mm thick, when I wanted to stick to the original scale of this guitar. But feather steel of this size appeared to be not applicable. After many failed attempts I finally decided to use silver wire, which allows for very fine stretching without strange bends or kinks. 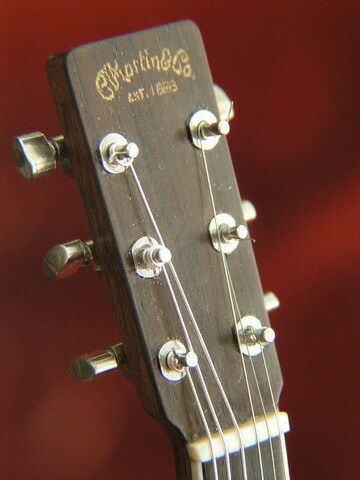 The upper three strings are made from feather steel, 0.12 and 0.08 mm thick. 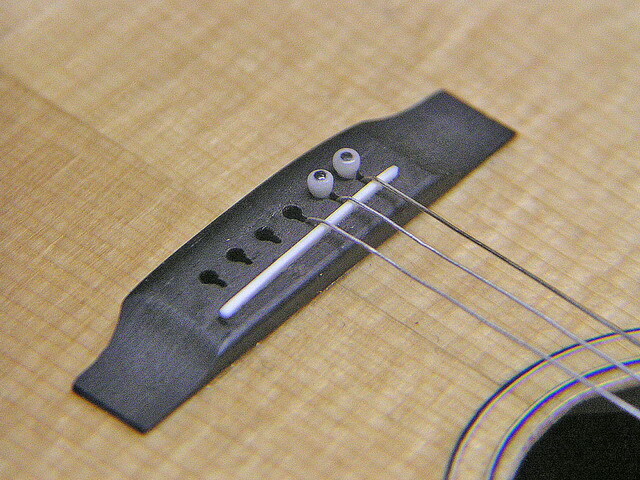 While mounting the strings unfortunately a few bridge pins popped out again due to the string tension and I could not find them anymore! They are so incredibly small that if you drop them on the floor you want see them… So a few bridge pins have to be made again. 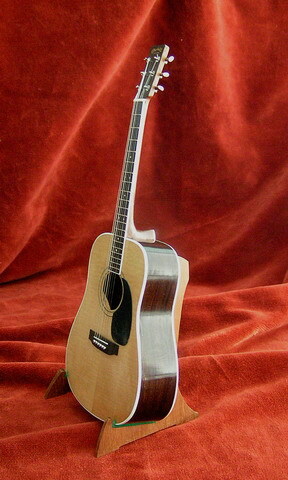 Eventually I managed to put all strings on the first guitar. 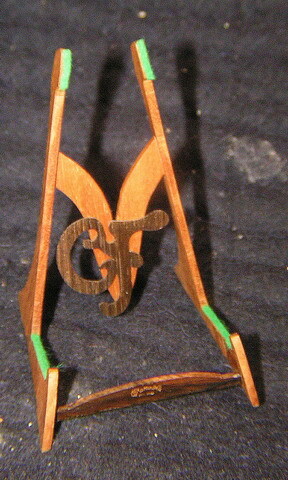 That is a ‘tour de force’ itself already, just due to the small dimensions. 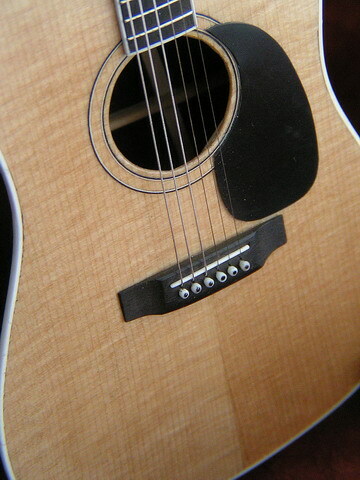 The strings do have tension but hardly any volume, so getting it in tune is not possible.